At Optimum Rehab, we believe that Personal Training is integral to a successful fitness program. When a professional personal trainer develops a workout plan targeted for you, you will enjoy progress and continuing results. Our personal fitness trainers Wall Street work with our Physical Therapists and other team members to develop a safe and effective workout plan for you. When you are undergoing Physical Therapy, there are special considerations a Personal Trainer must take into account in order to prepare the best program for your condition. They learn your history, know your therapy goals, understand the physical challenges you’re going through, and work to help you improve your fitness while reinforcing the positive results of your ongoing therapy. Having a Personal Trainer to guide you through your fitness routine will help you make sure, that you are spending time on the exercises that are best suited for you. Before embarking on any exercise regimen, you will be evaluated and assessed by our team of experts. A Personal Trainer will ensure that you are performing the proper exercises according to your potential, needs, and goals. Our Personal Fitness Trainers at Wall Street, New York City, Upper East Side, and Astoria are experienced, licensed professionals who are part of your overall wellness team. To have a Personal Trainer to guide creates a sense of responsibility that is often just the motivation people need to stay with a solid fitness plan. Personal training improves your long-term health and wellness. Staying in good physical condition enables the body to recover illness more quickly, recuperate from injuries faster and be less likely to develop serious health problems once issues arise. We are here to help you get well, stay well, and live well. 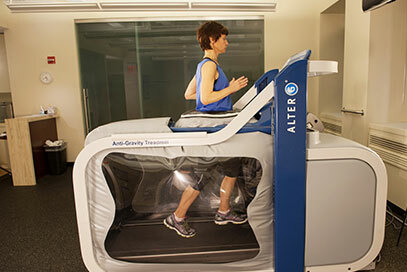 We incorporate specialty equipment including the Alter-G anti-gravity treadmill into strength and recovery programs to provide pain-free exercising. This non-impact workout reduces recovery time while healing from an injury or surgery. Make an appointment today at our Optimum Rehab Physical Therapy offices to start your Personal Training under the guidance of experienced and licensed professionals.